Have you ever seen a shoe with air conditioning?. Well that's what you will get with the Alegria Breezy clog. Select your size above for the comfort and style you love from Alegria shoes. Leather upper; manmade sole. Great, Like new condition. See pictures for details. Alegria Seville Professional Women's Clogs, Black, US 9 (EU 39) SEV-601. Condition is Pre-owned. Shoes Are In Good Condition Overall. No Rips Or Tears Present. Some Creases And Minor Spots Are Present. Minor Dirt On The Bottom Soles Are Present As Well. Please See Photos. Shipped with USPS Priority Mail. Thank You For Shopping. 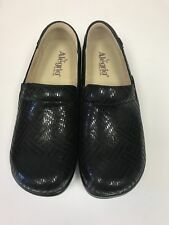 Allegria Keli Black Emboss Paisley slip on shoes in excellent condition with very little wear! Leather upper and lining. Ladies’ size 38. THIS IS A PAIR OF ALEGRIA CLOGS IN VERY NICE PRE-OWNED CONDITION. BLACK LEATHER UPPERS. NO HOLES OR LOOSE STITCHING. This item is considered to be EUC. Alegria Womens Alli Clog Shoe Size 40 New ! Alegria Womens Alli Clog Shoe Size 40 New ! . Condition is New with box. Shipped with USPS Priority Mail. Size US 8-8.5 /EU 38. Good Condition ! Alegria Shoes Women's Size 37 US 7-7.5 ALG-101 Clogs Black Patent Leather Black. Condition is Pre-owned. A few cosmetic issues but overall good condition. See all photos as they are part of the description. Shipped with USPS Priority Mail. Length (heel to toe)-10.5". Shoes are like new and in excellent condition. Heel-1.75". Insoles-10". Width-3.5". Brand NEW ALEGRIA Black Leather DENA Neoprene Dream Fit Shoes 37 US 7 Womens . Shipped with USPS Priority Mail. Non smoking home, thank you for looking. In rare cases, with rare shoes, this may not be the case. I will do my best to accommodate them all. · I’ll do right by you. · All shoes are authentic. I do not deal with anything else. Removable footbed, takes the Alegria Classic footbed style, you can even insert your own orthotics. Professional Slip-on shoe featuring a printed Waverly design on genuine leather. Leather covered insole allows for your feet to naturally breathe, leaving them feeling fresh and dry. Style: Comfy Clogs Shoes. Size : 10.5-11 / 41. Material : Leather. The shoes are in very good pre-owned condition. Color: Black. ALEGRIA Classic Black Waxy Clogs, Size 41 EU, in good condition. Professional Nursing Clogs Shoes. Black Mosaic. In great shape. I’ve tested the extra inserts in these shoes and they fit perfectly. This may not be the case for everyone. WM PG Lite Alegria Kayla 430 Black Patent Nurse Mule Clog Shoe SZ 40/US 8.5-9M. Condition is Pre-owned. Shipped with USPS Priority Mail Padded Flat Rate Envelope. Light general prewear as noted by soiling on footbeds/soles, light creasing of uppers, and wearing of sole heels edges. Algeria 38 clogs. Black, New In Box. Never Worn. Algeria 38 clogs. Black, New In Box. Never Worn.. Condition is New with box. Shipped with USPS Priority Mail. Shoes are preowned and do have scratches, scuff marks and staining throughout both shoes. Shoes also have wear and tear to both inner and bottom soles. I have enclosed many pictures with different angles for your careful inspection and consideration. Worn just a few times. In great condition. With box. From smoke free home. Shipped with USPS Priority Mail. (G1087 bin) Fair used condition with wear as pictured. The seam on the top edge of the left shoe is loose as pictured Womens ALEGRIA DEB-531 'Debra' Black Embossed Shoes Clogs SIZE 41 US 10.5-11. Condition is Pre-owned. Shipped with USPS Priority Mail. Alegria Khloe Black Nappa Loafer Clogs. Hook & Loop Buckle Strap with Stud Accents. Padded Heel Collar. Stain Resistant Leather Upper & Lining. We try our best to go over all shoes and describe them with accuracy. Alegria ‘Seville ’ comfort clogs. --Marked 35. -- Adjustable b uckled belt over top of foot can be swiveled to function as a slingback. --Soft brown leather lining. Extra padding over top of foot. Alegria Women's Kayla KAY 601 Leather Clogs Black Nappa, 6M 38. Shipped with USPS Priority Mail. Overall great condition, minor spots of wear on uppers, shown on pics. ALEGRIA Classic Clogs in Black Snake Print Leather. Pattern: Snakeskin printed leather. Model: Classic Clog ALG-701. heel height: 1.75". Size: EU 36. - Leather lining. Alegria Black Patent Butterfly Comfort Shoe Clogs Size 40. Condition is Pre-owned. Shipped with USPS Priority Mail. Very nice display shoe in great condition! Toe to Heel:10.5". Material of shoe is very clean with no marks, velcro is intact and work great! Great looking shoe! Insole:10.25". Inner and outer soles are clean with no marks.